The interconnectedness of communities, organisations, governing bodies, policy and individuals in the field of disaster studies has never been accurately examined or comprehensively modelled. This kind of study is vital for planning policy and emergency responses and assessing individual and community vulnerability, resilience and sustainability as well as mitigation and adaptation to climate change impacts; it therefore deserves attention. Disasters and Social Resilience fills this gap by introducing to the field of disaster studies a fresh methodology and a model for examining and measuring impacts and responses to disasters. Urie Bronfenbrenner’s bioecological systems theory, which is used to look at communities holistically, is outlined and illustrated through a series of chapters, guiding the reader from the theory's underpinnings through research illustrations and applications focused on each level of Bronfenbrenner’s ecosystems, culminating in an integration chapter. The final chapter provides policy recommendations for local and national government bodies and emergency providers to help individuals and communities prepare and withstand the effects of a range of disasters. 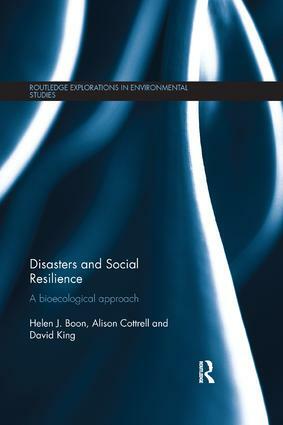 This book will be of great interest to scholars and students of disaster and emergency management, disaster readiness and risk reduction (DRR), and to scholars and students of more general climate change and sustainability studies.